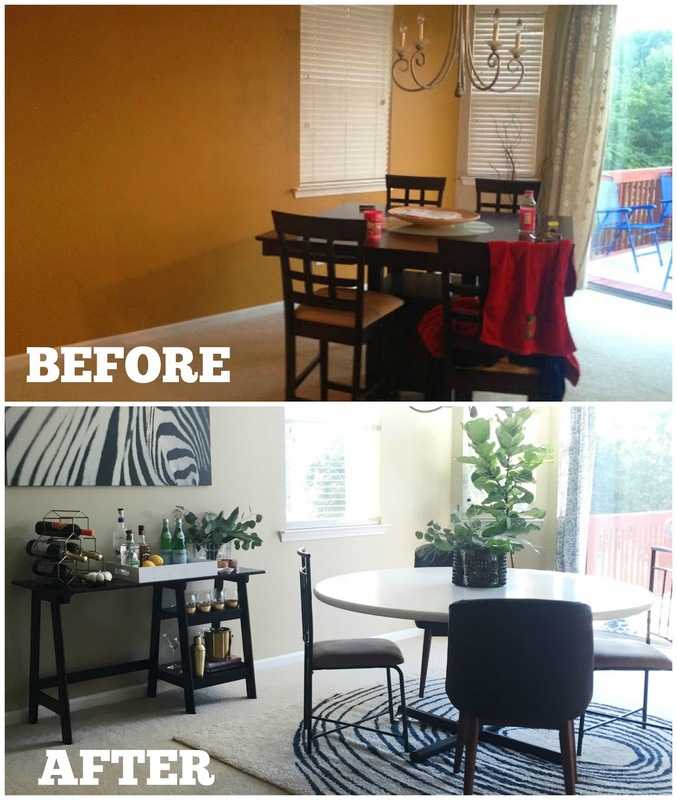 This actually was never a post idea but as I look at my dining room now I am compelled to share the difference and the completed (for now) space. There's are two reasons why that I'll share at the end of this post. Let's take a trip down memory lane shall we! oh.my.goodness is all I can say. I'm looking at this picture and just thinking how much I hate this paint color and this table. At the time, I loved this room. Today... not so much. I actually painted this wall twice. The first shade was just horrible and I settled on this one here After hating this color for 6 months I decided to lighten the space. I also added this piece of art from Hobby Lobby. I thought it complimented the table well. I was becoming even more restless with this table set. I was growing more into my style and pretty much made it up in my mind that I hated matching dining sets. So I tried to add some variation by changing out the fabric of the chairs. I also realized I didn't like that art much and wanted some a little less traditional. 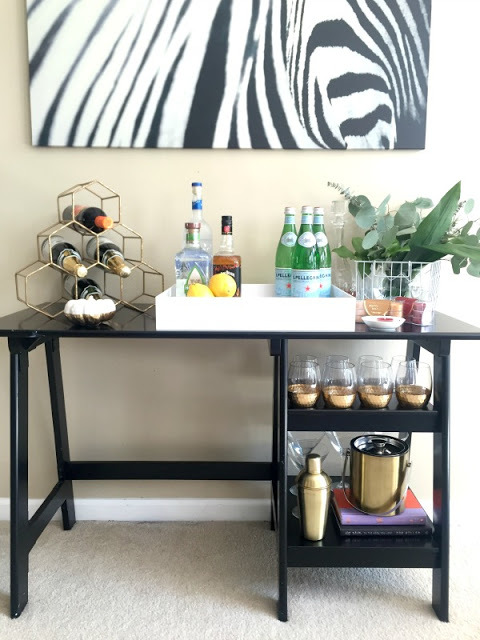 I instantly fell in love with this zebra print from IKEA. That still wasn't enough for me so I figured I would get rid of this table. I didn't care how much everyone else in the house loved it... I was over it. 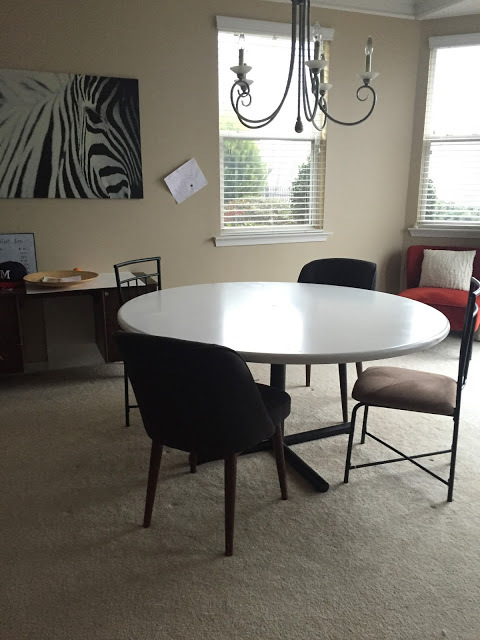 I ventured over to craigslist to get a low top, round table. I found a couple of chairs on craigslist too and another pair at Bargain Hunt. I planned to paint the top of the table white.....but it was too small. It was a 48" table and after having it in the space for a while I realized it wasn't going to work. Thanks to a family friend, I was able to get another table top. He hand-made this table top for me. It measures 60" round. He mounted it onto the existing base. at this point, I was feeling much better and much more inspired by the space. The previous table was given me serious inspiration blockage. Now, if you checked out the first link you will see there was some things I really wanted for this space. 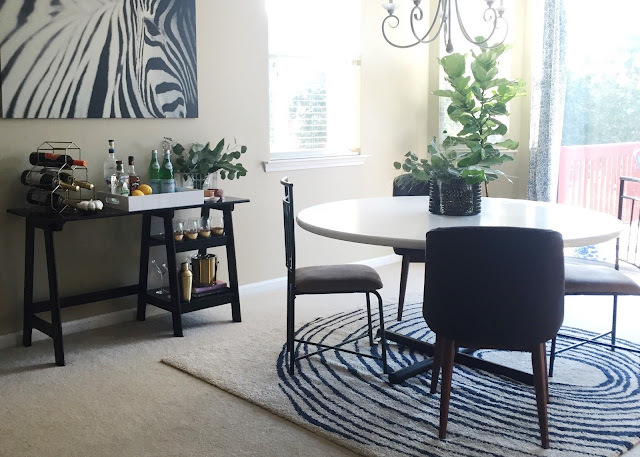 A mini-bar, a nice rug, to update my vase and some curtains were a few of the things. Well friends, I'm happy to saw that I FINALLY have all of those things. The last two thing on my list for this space is a new chandy and hardwood floors, but in the meantime I'll sit back and enjoy my completed space. 1. Please know that it takes time for a room to come together exactly how you like it.. I know it can seem that things just happen overnight in blog world or TV, but please know, it takes time, AND THAT IS FINE! 2. It's ok for your design style to change. I went from one extreme to the other. There is nothing permanent about style.. it's evolving! I loved taking a moment to look at my progression. Did you like this post? If so, please consider subscribing to my newsletter. 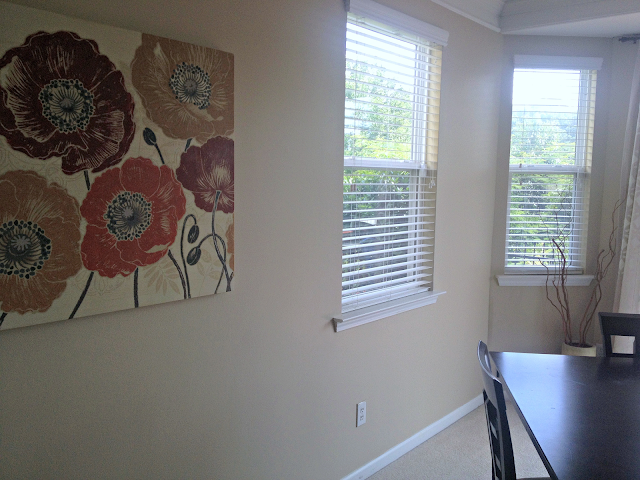 I love your dining room, Alaya! I can definitely relate to the way our stlyes change over the years. I look back on old pictures from me previous apartments and can't BELIEVE some of the choices I used to live with, lol. lol! It's amazing how things change! That's the best part I love about having this blog, I can always look back in time to things I may have forgotten. I love looking back at old pictures of my home and seeing all the changes I've made...its so exciting seeing the evolution and its so much better to change things up as out tastes change vs. living in a time capsule, that we're no longer feeling! 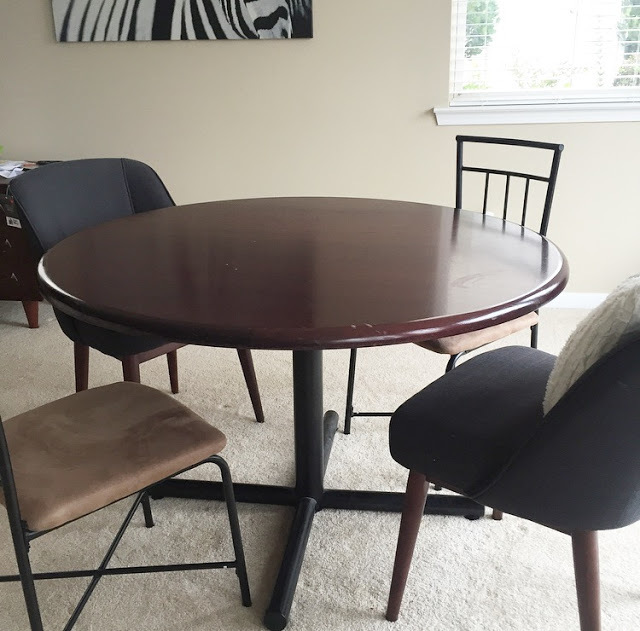 You have a great space and I love that you switched out the table, so agree a large round table is better fit and it all looks so fresh! and amen to not living in the old time capsule! Alaya I love the progression and the completion of your space, and you're absolutely right about evolving style. You live and decorate how you feel, how you age, and how your family grows and changes. Love this post! Thank you Liah! I totally agree with you, feelings, age, and family def influences your home! So fun seeing how your style has evolved (mine definitely has too). 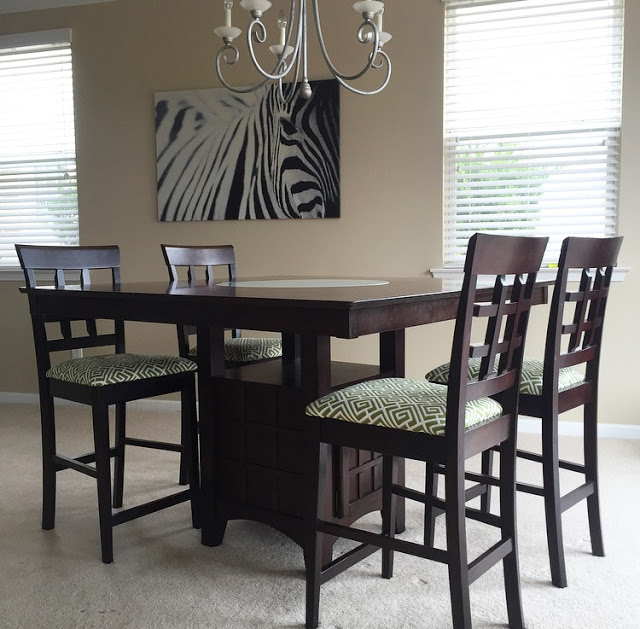 Your dining room look so bright and inviting now - love those upholstered chairs especially, and the bar is awesome!